Pic 1 is a birch 22" tall 21" wide and about 1/2" trunk at base. Pic 2 is a ash (rowan) 19" tall 6" wide 1 1/2" trunk at base. Pic 3 and 4 is also an ash (rowan) 16" tall 6" wide 1 1/4" trunk at base. Pic 5 and 6 is a birch 26" tall 27" wide 4 1/2" trunk at base. Pic 7 8 and 9 is a beech 14" tall 39" wide just over 1" trunk at base. Thanks for you help. Mike. I'll give this one a go since I should imagine we have similar climates. First of all I'd get that last one into a deeper pot. Then I'd leave them all for at least a year to let them develop. If it was me, the only thing I'd do right now is remove any branches I'd never want as part of a design and remove any excess height. But that would only be if the trees had responded since collection by throwing out loads of new growth. I'm also struggling to get an impression of the size of these so it would be great if you could give us some dimensions - height, girth etc. The pictures aren't revealing species too clearly so if you know what they are (I see a label in at least one of them) it may help others to contribute if you could let us know. It would also be helpful to know your level of bonsai experience as I don't want to treat you like an eejit if you're a black belt in bonsai. Thanks for your help as you can see i have edited the post to give more info,hope this helps,and yes your climate is about the same as ours here in cavan,all the tree's have got good new growth on them as well as new root systems they are doing well since i got them at the end of march. 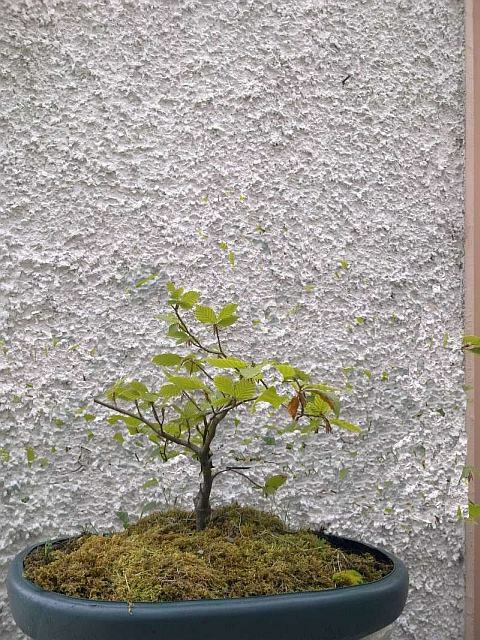 I am only new to bonsai (so maybe an eejit but defo not a gombeen ha ha ha) and have bought some tree's but have not as yet done any thing like cutting and wiring,just ropotting and gen care on the ones i have bought,these tree's pictured here have some branch removal but that was done by my friend before i got them off him. Mike. I certainly leave the birches for a while as my experience with them is that they go off in the huff when they're disturbed. By leaving them this year you won't be wasting time on them if they're just going to up and die on you next year. The rowans (take it you mean mountain ash rather than true ash) seem to be able to take any old beating. For both rowans and birches, I'm finding that they respond really well to seaweed fertilisers. I use Maxicrop and I'd suggest that if you aren't already doing so, feed them often. I feed every second day and the new growth is phenomenal. We've had a lot of rain so there isn't any danger of "over-feeding" though the experts will tell you that isn't something that should happen anyway with organic fertilisers. Style-wise, I'd be tempted to lose the left branch on pic 1 and see what develops from the right ones. It has a natural weeping shape which could echo a Betula pendula if you can get it to twig up. The rowan with the bulbous bit might call for an air layer. My experience with this technique is limited but Will B and Kev and probably some others are the real experts in that. But as I said earlier, feed feed feed and get it (and the others) to bud back as much as you can so next year you have many more options to choose from. I'm pretty sure that the "rowans" are not Sorbus aucuparia, but Fraxinus excelsior (Common Ash) because of the black buds and the bark. If you search "Fraxinus excelsior" on this forum, you will get some info. Your eyesight is better than mine, Alain. I did think that originally myself (atho' I'd thought Beech instead of Hornbeam) and was hoping Mike would give further clarification when he next is on. Mebbe I'm just going to have to admit defeat and start wearing my reading glasses. Seems like I have caused a little conflict here So I took a close up photos of the leaf in the last 3 pics to see what you all think. Hope this helps. Thanks again for your replies. Looking forward to more ideas if possible, cheers Mike. fiona wrote: Your eyesight is better than mine, Alain. I did think that originally myself (atho' I'd thought Beech instead of Hornbeam) and was hoping Mike would give further clarification when he next is on. With the new photos, although they're a bit blurred, your first idea was the right one : that's beech Fagus sylvatica - for latin names, just ask Iris , aye, for sure lass. Cheers alain for your info. Yes the last 3 photos are of a beech not a birch as I had written on the first post but have now amended. Sorry for any confusion - still looking for any ideas what to do with them ? Cheers Mike. Anybody else have any ideas. Well, I will probably disappoint you, but I think that this beech needs a few years in the ground before you can do anything with it. I would chop off the branch that goes at a right angle too. Like I said earlier, I think they all need some time in the ground or deep pots to develop. I also said I'd consider removing stuff I knew I didn't want in any future design and that would include the branch to the left in Birch number 1. I'm not so sure about the branch going off horizontally in the beech as it is the main branch. You could have a go at trying to straighten it out with raffia and heavy wire while it's still relatively flexible. But it gets back to letting them establish well and in the meantime work on something else. It's veery much a patience game we play here. I'd like to put my 2cents worth in as well if I may. Mike, with your Ash (photos 3 and 4), Air layering is a good option. I've done a lot of Air Layering myself but I'm relatively new to IBC so I don't yet know what information is available here about the subject. Someone else may be able to steer you on the right path. There is another option with that particular tree. That option is to drill a series of small holes (the diameter of a toothpick) about 3/8th inch deep (10mm) around the widest part of that huge base above that single root, apply some rooting hormone powder or gel and insert toothpicks in the holes - the toothpicks will prevent the holes from just callousing over - then re-pot into a deeper pot and cover the wound area with potting mix. That will encourage a nice even spread of radial roots round the base. When they are of sufficient size, that large heavy root can be removed. I like the "toothpick trick", very interesting, thanks for the tip. Here in Europe, air-layering a fagus is best done in February, several weeks before buds break out. For this one, the air-layer was done in April, but the roots develop fster when done while the tree is still dormant. fiona wrote: Like I said earlier, I think they all need some time in the ground or deep pots to develop. I also said I'd consider removing stuff I knew I didn't want in any future design and that would include the branch to the left in Birch number 1. Qlander wrote: I'd like to put my 2cents worth in as well if I may. AlainK wrote: I like the "toothpick trick", very interesting, thanks for the tip. I like the tooth pick idea also,sounds like something to try on that ash with the bulb on it. Maybe i'm wrong, but I assume that it's much cooler and wetter than it is now in France. So I would cut out branches, and even defoliate (leaf-removing) even at this time od the year. Large cuts should be coated with "Japanese wound sealing", or sticky aluminium, or self-sealing rubber bands. 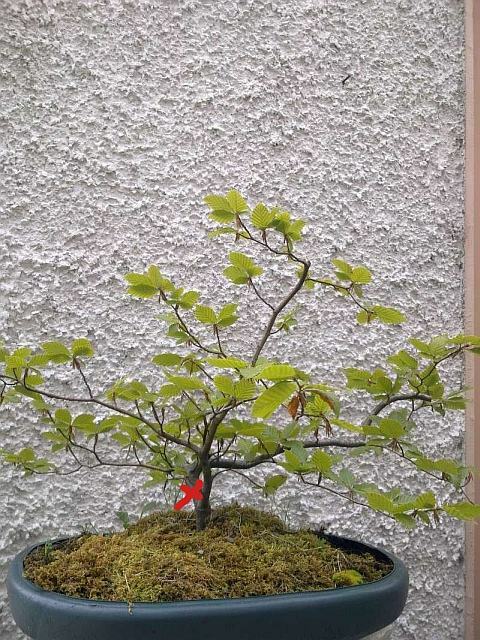 But contrary to what you can read here and there, defoliating, and even shaping a "Fagus" is quite safe at tjhis time of the year, providing it's in good health. Yours seems to be a bit weak (chlorosis ? ), but if you feed it now and after (don't forget to add chelated iron !) , I'm pretty sure it will thrive, green and healthy as Ireland. 1st, I would cut out the biggest branch. 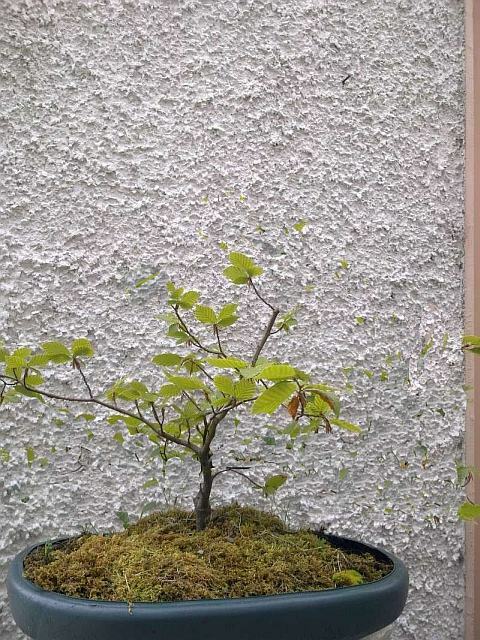 It's either this one, or the other, but a "weeping" style doesn't speak to me for a Fagus sylvatica. 2ndly, an "intermediate" option : the first tiny branch on the right would stay, but just as a "sap-feeder" for the lower part of the trunk. The first branch on the left would remain later, but let grow freely at this stage. "My" option : drastic pruning. Of course, use wound sealant, parafine, etc, so the scars heal as fast and good as possible. In late winter : repot, trim roots. By then, new buds will have appeared on left branches and even, "trunk" : select. For me, that's the way it goes. End of the story. Yes it is a little cooler and wetter here in Ireland at this time of year than it is in france,even as i write this it is raining quite hard,even had a spot of thunder and lighting yesterday afternoon with rain and hail stones (mad isnt it). So even with this kind of weather and at this time of year you say it is ok to do some cutting and seal all cuts,well i think i might just do that,i like the look of the finished photo you have done and may go for something like that. As for the colour of the leaves,the leaves are darker than what you see in the photo,and are much greener,must have been the light condition on the day the photo's where taken (it was a bright sunny day and photo was taken against a wall that reflect's quite a lot of light) also i checked the leaf colour against a few tree's that are in my area and they all seem to be of around the same colour. I think i may do a little work on it this weekend,thanks for your help again... Mike.